There is nothing more luxurious in my skincare routine than the Skin Caviar Luxe Sleep Mask from La Prairie. I have loved La Prairie products in the past, so I was very excited to use this overnight treatment and experience the magic of Skin Caviar. Its so luxurious and my skin loves this product. I wake up to smoother, healthier looking skin and much less redness. Did I mention, my skin got irritated during my Banff vacation and for the past week at home, my only goal had only been to reduce the spots on my face. During the holidays, its hard to give as much attention to skincare as I would like because I am always surrounded by food and family and literally there is no time for a proper routine, other than cleansing and putting on this overnight treatment. 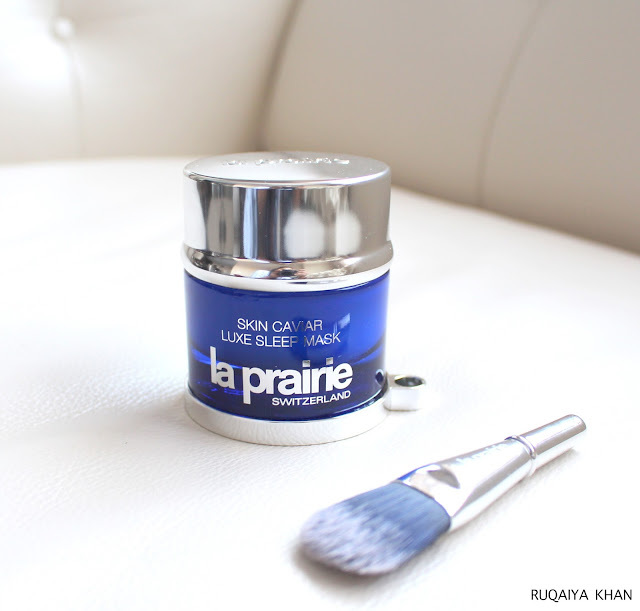 Thankfully, the Luxe Sleep Mask is working to calm my skin down while nourishing it with caviar extracts. Its not just any luxury beauty treatment, it's so much more and its helping me achieve healthier skin that looks and feels beautifully smooth and firm. Wish I could bathe in this! 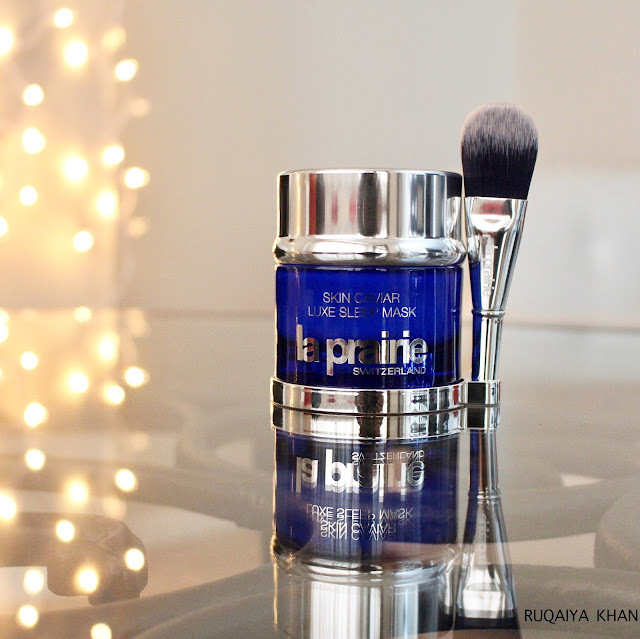 La Prairie Skin Caviar Luxe Sleep Mask is an overnight firming mask, that is rich in caviar extracts and helps to nourish and boost skin's long-term firmness. My skin was a mess until I started using this. It was red, flaky and in dire need of hydration. I broke out around the periphery of my face and had brown spots where the acne had dried. I badly needed a treatment that would nourish my skin, restore its overall texture and appearance and this Luxe Sleep Mask did exactly what I wanted and more. It brightened my complexion and my acne marks are improving quickly. I feel that my skin looks much more hydrated and well rested, even my husband noticed the difference! To apply, I simply cleanse my face (and I am back to hot cloth cleansing) and dot a generous amount of the Skin Caviar Luxe Sleep Mask on my forehead, cheeks and chin.Then using the brush I spread it evenly all over my face and then I massage the cream as instructed. I always wash and dry the application brush as mentioned on the packaging and I feel this step evenly spreads out the mask and ensures that every crevice on my face gets covered with this mask. The mask quickly absorbs in skin and does not feel heavy at all. It does not transfer to my pillows or my clothing. Its an exceptionally well formulated mask, that works so well over night. Every morning I wake up to smoother better looking skin. My skin looks brighter, smoother and my pores look much improved. I am hoping that my acne marks would lighten ultimately with continued usage because they certainly have improved over the course of two weeks. Now, I am so tempted to get the Luxe Eye Lift Cream to improve my undereye situation. Its crazy how much of a difference good skin can make to my overall self esteem and I am so excited that I am beginning this new year with a great skincare regimen. I have a few more skincare products that I will share this month and some very exciting high tech skincare tools. Wishing you all a wonderful new year! !